One of China's biggest internet stars Papi Jiang has promised to "correct" herself, following warnings from government officials. The video blogger had reportedly been reprimanded for the use of foul language by the media authority. It comes as China tries to clean up the Chinese internet, with measures from stricter censorship to urging users to behave better online. President Xi Jinping this week called for a "clean and righteous" cyberspace. The 29-year-old, whose real name is Jiang Yilei, is a hugely popular internet comedian and video blogger. She won fame through her humorous short videos, usually of herself talking in rapid-fire Mandarin, making light of topics ranging from dating woes to regional Chinese accents. The videos on her Youku channel have had about 100 million views, while on microblogging network Sina Weibo she commands a following of at least 11 million people. She is so big that she is believed to be the first in China to receive funding from private investors, to the tune of nearly $2m. But she is not known for delving into sociopolitical issues or other sensitive topics that usually invite scrutiny from authorities. On Monday, the Chinese Communist Party's mouthpiece People's Daily published a short report quoting media authorities as saying she had been "disciplined and corrected" for using foul language. It is not clear to what extent she had used swear words in her transmissions. The State Administration of Press, Publication, Radio, Film and Television said it had taken offline the relevant clips to "get rid of the vulgar and coarse content", and that it could be made available online again only when it adhered to content regulations. 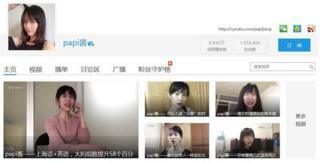 A check on Papi Jiang's Youku channel on Wednesday found only five videos displayed, none of which worked. In comparison, her Youtube channel features scores of clips. On Monday evening, Papi Jiang issued a short statement on her Weibo page where she thanked fans for support and hinted at being disciplined. "As a self-made media figure, I will also be more careful of my words and image, resolutely responding to requests for corrections in internet clips, and broadcast positive energy for everyone," she said. Fans have flooded her Weibo and Youku pages with supportive comments while cursing or criticising the authorities. "Not everyone may like Papi Jiang, but definitely everyone hates the state administration," said one Weibo user. A commenter on Youku criticised officials for having "the kind of weak regulatory attitude where it's afraid of just a little bit of vulgar language". Chinese authorities have recently stepped up efforts for what it calls a more "beautiful" internet, in what critics say is a greater push for censorship. It has urged users to behave better online, such as not spreading unverified internet rumours and acting with greater civility, while at the same time increasing curbs on expression such as the deletion of critical internet comments and online media articles. Authorities have conducted crackdowns - an online letter calling for President Xi Jinping's resignation resulted in at least 20 people detained. On Tuesday state news agency Xinhua reported that Mr Xi had told an internet security symposium that China needed to improve the management of cyberspace "and work to ensure high quality content, with positive voices creating a healthy, positive culture that is a force for good". "He required that cyberspace be imbued with positive energy and resonated to mainstream ideology, in the hope of creating a clean and righteous environment," the report added.